I am Therefore iPad: Check out SCOtutor for iPad - Free for a limited time. 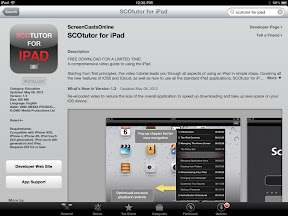 Check out SCOtutor for iPad - Free for a limited time. If you are new to the iPad and/ or Mac, then have a couple of iPad apps that you just may love: SCOtutor for iPad and SCOtutor for Mac. These are iPad based training video apps on the respective subjects. There are free for a limited time. Normally $2.99 USD, you can get this awesome app for free.